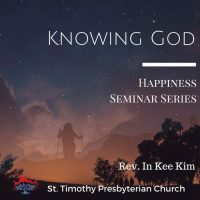 The second of a 2-part series on “Knowing God”. Recorded at the 2016 congregational retreat held on June 24, 2016. I was sitting here while the praise team was practicing, it’s not always simple as you think because they have to change their chord and emphasize certain parts and they have to coordinate, so it’s always emotional and inspiring and inspirational. Thank you very much. And while listening to the praise I had this kind of image or message in my mind. The message is that you go in and liberate people from the concept of me because people are instantly in their own concept of me. I want them to know me rather than holding onto the concept that they have. I want them to know me. That kind of message came up very strongly while listening to praise. I think that’s the main message for this retreat. Instead of just holding onto that concept of God, we need to let go. Even though it’s scary sometimes, you have to let go of that so that we can encounter and meet the living God the real god. So what we want to do. Now we want you to be the agent of doing that movement of truly knowing the living God. I’m going to explain a little bit later. This morning we discussed three things at least. Depending on what understanding you have about God your relationship with God will be very different. If you have nominal God, your relationship with God will be just, “God is there”, and God is not involved in your lives. It affects the relationship between you and God and also affects your lifestyle, your worldview, and your morality. So it is important to have, not right understanding, I don’t want to say right or wrong, I want to say living understanding, the real understanding of God. Then your relationship with God will become much more vital, alive, and your life will become much more abundant, filled with hope and riches and the power of God. When you truly have an understanding of God all these things will be the characteristic of your life. I hope that we all understand that God, cause it’s important to know God. Secondly, knowing God is not to fill your brain with the information. We have a tendency to continuously know with our brain because that’s the only way we learn how to know. The education system’s only way to know is through your brain. But the real knowledge does not necessarily come from the brain. The real knowledge comes from your life, the whole existence. Our whole understanding of knowledge is a problem because we only think, when we get to know somebody, we only think about brain exercise, cerebral exercise. But knowing God is very different. You can never know God with your brain, you can only know God through your whole existence. So knowing God always brings about transformation and change. Knowing God does not leave you alone, knowing God and change always go together. When we do a brain exercise it can be totally separate from the rest of your life. But in knowing God you have no choice but to change, personal change. It brings transformation, not information. Thirdly, knowing God is a process. It’s a journey. It is a process of our eyes being opened. It is a journey of hide and seek. Sometimes God hides and we seek and we find God and then we get arrogant and too confident, and God hides again. And then we seek God again and you find God and then you get overconfident and God hides again. And then you go and seek out. That process has to continue. Hide and seek, but sometimes we find God about 10 years ago, 20 years ago, and nothing changes at all. How is it possible? How’s it possible that you know God once and then that’s it. Because the only thing that you can see is a small fraction of God. You cannot see the whole of God. How can you say that? This is everything about God. That is problematic, that itself is a problem because we only see a partial thing and you’re making it whole. A blind man went to the elephant and touched it on the leg and he said, oh, it’s a cylinder. I mean yes, he has a leg like a cylinder, but it’s not. You’re right that when you say that, ‘yeah, an elephant has a cylinder-like leg’, that is right. But when you start saying that that elephant is a cylinder, then you’re wrong. In the same way when you know only partial God and then you say that that is a whole of God then it becomes a problem. If 10 years ago, 20 years ago you understood God in a certain way, and that doesn’t evolve, that doesn’t change at all, after 10, 20 years, then you have to ask yourself is that really a true God to you? Or you’re fixed there. So we have to ask ourselves. Knowing God is an ongoing process until we die. Every day a new understanding of God will be revealed to you. So we looked at Ephesians 1:17-19. You come to know Him and then the eyes of your heart are enlightened. You will have hope, riches, and power. This is a process. That’s what’s going to happen. That’s what Saint Paul prayed for. He sees his future life, the X-Ray, he sees so well. That’s what he prayed for. The Christians in Ephesians, in Acts, something like scales came off from Paul’s eyes. That is embodied. Say, yes, maybe it actually happened but it is a symbolic way of saying that Paul’s eyes were open. So when you look at Acts 9:18 it says: “and immediately”, that’s right after Paul met Christ on the road to Damascus, “and immediately something like scales fell from his eyes and his sight was restored. Then he got up and was baptized, and after taking some food, he regained his strength”. His sight was restored; he was never blind. He was able to see fine, but his sight was restored for his insight was restored. His insight about God was restored. He became a new man and he was able to see God in a different way. The reason Jesus Christ came to us was to show the living God. When people were totally enslaved by the God of law, Jesus Christ came to reveal the living God. That’s why Jesus Christ came to us, not to teach us more information about God, but to reveal the living God to each of us. Revealing does not mean that everybody can see it obviously. That’s not what a revelation is. There is a hidden aspect in revealing, you have to have a certain condition to be able to see what is revealed. For example, Paul did not see what he saw for the longest time and something happened within him and then he was able to see, that’s what revelation is. There has to be a certain condition of the heart to be able to see what is revealed. Elizabeth Johnson defined the living God in this way: The term living God evokes the realization that there is always more to divine history than humans beings can nail down”. If you nail down who God is 10 years ago and do not change, then is that the living God or a concept of God? Living God always is a realization that there is always more to divine history than human beings can nail down. Jesus Christ came to not only save us, Jesus Christ came to save God. Jesus came to save God from stale, naive, worn out concepts to be the living God. Jesus Christ came to save God, Jesus Christ came to free God from the prison of human ideas and concepts. So Jesus Christ did not come just to save human beings, Jesus Christ came to save God and ultimately that is a way to save human beings. They have fallen into the idols. It’s like living water that is always springing up and running. You know, even though Jesus Christ came to give us, to reveal to us, the living God, many people didn’t get it. Even the disciples didn’t get it and we still don’t get it. The disciples started something new. They didn’t get it at first it, but they finally got it and they started something new. Then 2000 years later, we human beings fell into their old self. We don’t get it. I want to give you an example. It’s a conversation between Jesus and Philip, one of Jesus’ disciples. Jesus said, “if you know me. You will know my father also. From now on, you do know him and have seen it because Jesus Christ came to reveal the living God”. That’s what Jesus is saying to Phil, Phil said to him, “Lord show us the father and we will be satisfied”. How frustrated Jesus must have been. Jesus just revealed the living God and then Philip is asking Lord, “show us the father and we’ll be satisfied”. And Jesus said, “Have I been with you all this time Philip, and you still do not know me? Whoever has seen me has seen the father”. How can you say “show us the father?” It was such a frustrating moment. I mean, Jesus was so frustrated. He revealed the living God, but people did not get it because their eyes are not open. Even now, a lot of people don’t get it. Ultimately Philip encountered the living God. But it was hard for him to understand it at first. We need to encounter the living God. My friends let us not be by a counterfeit God. Counterfeit money looks exactly like real money. A counterfeit God looks exactly like real God, but let’s not be fooled by the counterfeit God. We human beings, strangely, have a tendency to create God instead of searching for the living God. That’s strange. I do that, all of us do that. We have a tendency to create God rather than searching for the living God. I call that idol. We have idols within us. Idols look very, very attractive to you. But we create idols because it’s easier, more simple, and more convenient. Idols are not a wooden sculpture that we worship. Idols are your perception, that’s what idols are. Having wooden sculptures are very naive idols, but your perception, that is your idols. When we impose certain fixed perceptions, ideas, or images on God then they become idols even though they are ideas. Yesterday, I said, God is revealed to you uniquely. That’s wonderful, personally and uniquely, but when you start absolutizing the God who is revealed to you, then that becomes an idol to you. You start oppressing other people. God created us in God’s image, but in the modern world, we create God in our image. God created us in God’s image, we should not create God in our image. But in modern days, we create God in our image. That is not the living God, that is a powerless concept of God. This powerless concept of God will never save you, will never make your life different. Counterfeit God only creates counterfeit religiosity, phony happiness. Almost like happiness forced upon yourself, almost like ‘I have to be happy, I have to be happy’, why? Why? ‘Because I’m Christian, I’m supposed to be happy. It’s almost like happiness being is forced upon you. That’s phony happiness, when you have counterfeit God then you impose that happiness on yourself, phony happiness. Language is all there, hope, riches, and power, but they are merely concepts. The content is empty. Sometimes in other services, when they do praise, content is missing. Real hope is not there, and you say you have hope, it is not real. Idols are the personification of what you wish and what you dream. That’s what idols are. From them you create God in your own image, idols are a personification of what you wish and what you dream. Martin Buber, we talked about him a few years ago. The one who wrote I Thou he wrote another book Between Man and Man. In that book, he said, “everyone should carefully observe what way his heart draws into”. You have to carefully observe what draws your heart is heart drawn to. What is your heart drawn to? Honestly, frankly, nakedly, we have to ask ourselves, how is your heart drawn? To where is it drawn to? We have to see what is our God. Simon said, those who made them, idols right, those who make them are like them. So are all who trust in that. And then I realized that ‘ah idols are not just perception, idols are not just personification of what to dream and what you want to reach; idols are yourself’. Idols are yourself. You are worse than yourself. That’s what idols are. And people like to do that. Your wishes, your dreams, your desires, your greed, are all about you. Idols are God we create in our own image. We kick out the living God to create our own image. One rabbi said, “God is not silent. God is silenced”. In your life God is not silent, you have made God silent, you have silenced God. He said, “God is in exile”. That’s what I’m saying that Jesus came to save God because God is in exile. Nietzsche, the modern philosopher, existentialist philosopher he described this very graphically, he said: “a madman lit a lantern at noon and went into the pumping market looking for God. Where is God? Mocked by the townspeople in an escalating series of exchanges, he finally threw the lantern to the ground it shattered and its light went out, ‘God is dead’ cried the madman. And we have killed him!”. That’s what Nietzsche saw what modern people do. In the modern world, we don’t create a space for the living God. We have kicked out God. God has been pushed out of our hearts, from this society, from this world. The only thing that is left within us is the god we created in our own image. Only concepts remain. The living God is not there, only the concept remains within us. Just the ideas of God, just the doctrine, and one’s own conviction remain. When we push God away from us when we are creating God’s image, what is left? A beast, only a beast. But animals with high intelligence and greed are very dangerous. Animals without intelligence or greed are non-threatening, but animals with high intelligence and greed are very dangerous. We see that all around we create nuclear missiles to destroy the whole world. What happened in Orlando? That’s what human beings can do and are doing all the time. Animals with high intelligence and greed are very dangerous. It is important for us to restore the living God within us. Knowing God is restoring the living God within us. So now I’d like to talk about three things in getting to know God. We can say that there are three stages. The three stages overlap each other. This is what we go through in our journey of searching for the living God. So if you really want to know the living God then this is what we need to. The first stage is the stage of accepting our ignorance as a first stage is accepting our ignorance. We have to accept the fact that we don’t know God. It is a way of casting out our idols that are made by our own prejudice, our greed, and our convenience. It is our humble attitude. This is the way to keep us from creating our own idols. Thomas Merton’s prayer is, our prayer, “my God, I have no idea where I’m going”. St. John of the Cross described his journey of knowing God in this way: when we humans beings reach the top of the mountain, unexpectedly, we see a huge cliff in front of you and you see many mountains in front of you. The more you think you know, the more you build”. I said you know nothing. All these spiritual giants, Thomas Merton or St. John of the cross, they are confessing that, and he said: “that’s when we enter into the cloud of beyond”. You start walking into the journey through the heart’s desire or pain, not by reasoning because reasoning can fool you. So you can search for God with your heart’s desire and or pain. We have to accept our ignorance, but there are two kinds of ignorance: acknowledged ignorance and unacknowledged ignorance. The ignorance that you do not even know that you don’t know is unacknowledged ignorance. But ignorance that you know that you don’t know is acknowledged ignorance, see the difference? When you read the Bible, Jesus often encountered unacknowledged ignorance. They don’t even know that they don’t know. Many religious leaders Jesus encountered were those, but unacknowledged ignorance is dangerous because it’s a different animal from acknowledged ignorance. Unacknowledged ignorance often accompanies violence. The people who live with unacknowledged ignorance, they’re violent, because they have to protect themselves. They don’t want to admit that they know so they are violent, they are aggressive. These people ultimately killed Jesus. What did Jesus say on the cross? “Father, forgive them for they do not know what they are doing”. They do not even know what they don’t know. Unacknowledged ignorance killed Jesus. Unacknowledged ignorance always brings violence and this kind of ignorance is total blindness. That is a kind of blindness St. Paul had before he met Christ. He thought he knew everything, but he did not even know what he did not know. They thought they knew or not but they did not know what they’re supposed to know, they shouldn’t know. Once Jesus healed a blind man on the Sabbath and to the Jewish religious leaders, the people who have ideas of God, the concept of God, it didn’t make sense. How could you heal a man on Sabbath? They said “You are a sinner! How can a sinner heal the blind man? That’s not possible!” So they asked the blind man, “Were you really blind?” and the blind man replied, “Yes, I was blind”. The religious leaders said, “I cannot believe you, bring your parents”. So they asked the parents, “was he really born blind?” and the parents were scared. They said, “he is old enough, ask him!” and they left. So the leaders came back and said “He’s a sinner. Jesus is a sinner because he healed on Sabbath”. Then the blind man said, “My friends I don’t know whether he’s a sinner or not but one thing I know for sure is that I was blind, but I see now, what else do you want?” That’s unacknowledged ignorance. What did Jesus say at the end? “If you were blind you would not have sinned, but now that you say you see, your sin remains.” Your sin remains meaning you’re still blind. The man who was born a blind man was not the real blind man. The real blind men were the Pharisees who thought they saw, who thought that they knew. They did not even know they did not know. That’s unacknowledged ignorance. This kind of blindness comes from religious convictions, so religious people, be very careful because if you’re not careful that leads to unacknowledged ignorance. It comes from over-dependency on your reason. Smart people be very careful. It comes from stubborn pride, and it comes from insatiable greed and strong narcissism. These things create and cause unacknowledged ignorance. But as we enter into the awesome and mysterious world of God we realize how little we know compared to the wonderful awesome world of God. That’s when you start seeing that you don’t know much. When you see true light, you see your darkness. When you see true righteousness, you see your own imperfection and simpleness and selfishness. When you see true love, then you’ll see your own selfishness. Letter to the Romans is all about that. Do you want to find out more about that? Read letters to Romans. He’s talking about acknowledged ignorance. He said, “I don’t understand myself. I try to do good, but when I look at myself, I’m doing exactly the opposite of the good. I keep doing evil, I don’t understand myself”. That’s acknowledged ignorance. It’s not “I understand myself” because he saw a bigger thing. That’s when you see the need for God’s grace. You recognize that ‘I need God’s grace to survive. I need God’s grace to live’. That’s when you can recognize your own ignorance. Jacob had a problem with his brother Esau. They were twins, Jacob and Esau. But Esau was a hunter, he went out and he lived like a man. Jacob was like a mama’s boy, he stayed home all day. But mom liked Jacob so he cheated at all kinds of things, and he got the blessing. But as a result of that blessing, he was kicked out. He had to run away from home because Esau was trying to kill him. So he ran away. When he got to the wilderness, he was sleeping and in the cold night in the wilderness, he finally realized “ah God is right here”. God has always been with him, but on that cold night in the wilderness, in the desert, he found God. This is what he said: “surely the Lord is in this place and I did not know it”. that’s acknowledged ignorance. “The Lord is here, but I did not know it”. You know, God is always with us and many times we don’t recognize God, you know the question ‘Where is God?’ is a fish swimming in water asking “where is water?” Once we had a retreat to Algonquin. Every year, 20, 30 young people went and we’d go into the interior. So we got to the North Tea lake and we parked the car and we rented the canoe and then we go in. So about two hours we were canoeing to find the island then all of a sudden Susie asked, “are we there at Algonquin yet?” We’ve been there the whole time! It’s like the “where is God” question and like a fish asking, “where is water?” God is always with us always around us, but sometimes we don’t recognize that. The prodigal son, only when he had to eat the pig’s meal, he recognized how little he knew and how arrogant he was. He didn’t know. Now he knew how much there was in father’s house. Sometimes when we encounter a crisis that paralyzes us and experience failure that drives us into helplessness and face problems that seemingly have no solution, our eyes open. I don’t know why. When we encounter those situations, our eyes all of a sudden open and see our own ignorance. We are so stubborn sometimes that we don’t see until something hits us. Only then we acknowledge how little we know. The story of a father, who had an epileptic son, he threw himself into the fire into the water and all that. He came to the disciples and asked: “please heal my son?” And the disciples could not heal him, and he came to Jesus, and he asked, “Jesus if can, can you heal my son?” And Jesus said, “what do you mean if you can? Nothing is impossible with God?” And then he got desperate. And he was afraid that he might have offended Jesus and then he said, “I believe, I believe.” Then Jesus said, “For those who believe nothing is impossible”. And then the man said, “I believe” and immediately after that he said, “help my unbelief.” That “help my unbelief” is acknowledged ignorance. We all need to have that, “Lord, I don’t know you, can you please help me see you? Help me know you, help me experience you. I don’t know you.” Like Thomas Merton, “I don’t know where I’m going”; “can you please help me?”. That’s acknowledging ignorance. An early church father, Anselm said a very wise truth. He said, “For I do not seek to understand in order that I may believe, but I believe in order to understand. For this also I believe that unless I believe I shall not understand.” How wise that is. It is not knowledge that brings faith, it is faith that brings knowledge. Only through that faith can you know God. Faith is not just religious activity, it’s not religious sentiment either, it’s not religious knowledge. For Paul, all of these things had blinded Paul: religious sentiment, religious knowledge, and religious activity. These things totally blinded Paul. To me, faith is kind of acknowledged ignorance and from that comes a strong desire to know God. When you have that acknowledged ignorance it leads to strong desire know God. When you have unacknowledged ignorance it leads you to violence. Or when you have acknowledged ignorance that leads you to a strong desire to know God and from that strong desire you can know God. ‘As a deer pants for the water, our soul thirsts for the living God’. In other words, in you, deconstruction has to happen first before reconstruction begins. You have to have a deconstruction process first for the reconstruction to begin. Unlearning has to happen first before the real learning can come. All our prejudice stubbornness and arrogance have to crumble down before the journey of knowing the living God begins. Idols have to be destroyed first for the true living God to come. We are created in God’s image. Let us not create God in our own image. When we reflected on Abraham, when do you think he really started the journey of knowing the living God? When do you think he really started the journey of knowing the living God? When he had to sacrifice his son Isaac, because it didn’t make sense, until that time everything made sense, but that moment it didn’t make sense. That’s why Kierkegaard wrote a whole book on that. That is the moment when he truly encountered his acknowledged ignorance. “I don’t understand this God. I don’t really understand this God.” That’s when the real journey began. God who asked Abraham to sacrifice his own son, was God beyond our ethics, custom, thinking and common sense, that’s the kind of God Paul experienced too. At that moment he realized that he didn’t really know God. All his ideas of God were shattered all his concepts of God were shattered. He was a man who worshiped the idols in them. They were full of concepts of a God who would give him prosperity. Those ideas were totally shattered when God asked him to sacrifice his own son. When Abraham was challenged with problems he could not solve with his own resources, Abraham finally had to lay down his well-defined concept about God. Then what did he learn about the living God? He learned Jehovah-Jireh. That’s “God provides”. That is the God he encountered, the living God. Then he lived with that living God all the time he always believed that God provides. Whenever difficulties come whenever dilemmas come, whenever the paradox comes, he always knew that God will provide. That’s the living God he encountered. And he lived with that living God, not with the concept of God. The first stage is the most important stage because the living God is not what you acquire. The living God comes when you lay down all your manipulation. The coming to the living God is God’s gift, not your effort. So second and third stages are pretty simple. The second stage is a stage of seeking. The prophet Jeremiah said, ” ‘Then when you call upon me and come and pray to me, I will hear you. When you search for me, you will find me; if you seek me with all your heart, I will let you find me, says the Lord,” Without seeking the living God we can never get to know God. God reveals himself to those who seek God. But things are when you have acknowledged ignorance it leads to the desire to seek, so the second stage almost happens naturally. When the first stage happens the second stage happens naturally. Elizabeth Johnson said in her book, Quest for the Living God, she said, “in every aspect, human freedom, like reason, is a dynamism that keeps on transcending beyond everything it grasps.” Wonderful. She’s a wonderful theologian. Human freedom is like that. You don’t just settle with what you know. Once you know it moves forward, to understand further. Jesus said, “you shall know the truth and the truth shall set you free.” You know, that’s the message that I got when I did praise this evening, set people free from their concept of God. Why are you scared to let go of those useless concepts that don’t do anything for you? Set people free from those useless concepts and let them find the living God. That living God will save them, the truth shall set you free, I want you to be free. Why are you so scared? Do you think God will punish you? God wants you to need him in a real way. That’s what God wants. And we need to be free. Now with that freedom, we keep knocking, we keep seeking. Part of the reason you don’t see, you don’t knock, is because other people say God is like this but I don’t believe that. Find your own God. Nobody can dictate who God is you. She also said this, “human spirit is characterized by an unrestricted drive towards the truth, which is ultimately boundless”. That should be our life. With an unrestricted drive, we refuse to stay within the small world we already know. Don’t stay within the small world you already know. You think that’s safe? That’s not safe. In life, if you don’t take the journey, you die. We strive towards the bigger world, we do not yet know that is seeking. That is a lifestyle Jesus taught us to emulate. “Ask and it will be given to you search and you’ll find, knock and the door will be opened you. For everyone who asks receives and everyone who searches finds for everyone who knocks, the door will be opened”. When you seek, when you search, when you knock you will find it. I guarantee that you’ll find it the living God. You will find a God who matters to you. A God for whom you would sacrifice everything. A God who has no effect on you, why do you need that God? Why do you need that kind of God? That’s the only concept of God, not the real God. We’ll meet the living God when we have a seeking attitude. The Prophet Jeremiah also said, “call to me and I’ll answer you and I will tell you great and hidden things that you have not known.” What you have not known, God will reveal to you. ‘Call to me’. The last stage is a stage of waiting. You have acknowledging ignorance, you seek and you wait. Knowing God is not a result of our efforts. It’s not even the result of our seeking. I’m not saying that our efforts are useless, but I’m saying that knowing God is not the automatic result of our efforts. Knowing God is only by God’s grace. If God does not reveal himself to us we cannot know God, and we thank God because God has a strong desire to reveal himself or herself to us. He even sent Jesus Christ to reveal. So in knowing God, there’s an active part and a passive part. The active part is seeking, searching and knocking. The passive part is waiting. The journey of knowing God is a cycle of active and passive process continuously. We seek and wait, we search and wait, we knock and wait. That should be our journey of knowing God. The living God is enveloped in mystery. We pursue, but we wait until the mystery is unveiled. We do not know how God will change us. We do not know that. We don’t know how God will change each person. You will hear the testimony tomorrow. God changes us in the way we can’t possibly fathom or imagine, God is beyond our imagination. This is not a statement of our limitation, but it’s a statement of God’s limitlessness. God is beyond our imagination that is. Isaiah saw that very well, “For my thoughts are not your thoughts, nor are your ways my ways, says the Lord. For as the heavens are higher than the earth, so are my ways higher than your ways and my thoughts than your thoughts”. It’s wonderful, isn’t it? In our pursuit of knowing God, we enter into the endless and limitless world of God. That’s why we don’t make conclusions or make closure on our own. We wait. We wait for what kind of world God will show us. The other day I was shocked that Britain is gonna leave EU. I never even imagined for 48 years. They are leaving EU, and what kind of world we’ll see, we don’t know. Life itself is a mystery. Everything has time. God planted his seed within us. There is the time the seed will break out of the shell. That’s when we truly meet the living God and know God. That’s why the song said, “be still and know that I’m God”. He knew what it meant to wait. Be still and know that I am God. Every day this waiting has to be there. The process of letting our prejudice down, seeking, and waiting. You know what’s more important in the waiting stage? It’s listening, in the waiting stage the most important thing is listening. God speaks to each of us differently, so we will hear different things. Also, our understanding will be all different. We won’t have a whole understanding of God, but it will be our authentic experience and knowledge of God. Isn’t that kind of exciting? Searching for the real God, the living God who matters to you? Instead of just holding onto the concept of God that you already knew. God is going to reveal himself or herself to you in a very fresh way and understanding that will be exciting. Saint Paul experienced and lived an exciting life. He died of persecution but until then he lived an exciting life. I would prefer to live an exciting life for one or two years rather than going ten years always scared, without knowing who God is. Knowing God is knowing ourselves because we are created in God’s image. Knowing God is also discovering yourself. It is to discover the essence of life. It is to discover the beauty of life. It is to discover the mystery of life knowing God is eternal life. “and this is eternal life that they may know you the only true God and Jesus Christ who whom we have sent”, that’s how John saw eternal life, I hope all of you live eternal life and have that eternal life.